The MSI Z270I Gaming Pro Carbon is on its own in this month’s group test, being cheaper than the premium offerings, but taking a very different route from ASRock’s similarly priced Fatality Z270 Gaming The Z270I Gaming Pro Carbon sports both Type-A and Type-C USB 3.1 Gen 2 ports, while the ASRock board lacks the former. In total, though, the ASRock board has one more USB port and double the number of USB ports that are faster than USB 2. ASRock has also bolstered the Fatality Z270 Gaming with two more SATA 6Gbps ports than the Z270I Gaming Pro Carbon, and offers full Thunderbolt 3 support too. Aesthetics are always subjective, but for our tastes, the ASRock board has an edge here. It also sports heatpipe-equipped cooling, while the Z270I Gaming Pro Carbon returns fire with a black design and steel-encased DIMM slots. 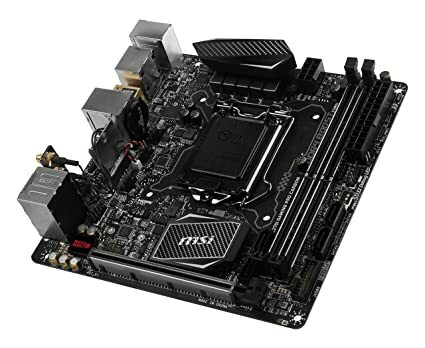 Both boards also offer Realtek ALC1220 audio and 802.11ac Wi-Fi, along with a trio of 4-pin fan headers and clear-CMOS buttons -the latter isn’t even offered by the Asus ROG Strix Z270I Gaming. There’s very little difference in terms of layout either – neither the MSI northe ASRock has any significant issues, and both have their single M 2 ports on the rear of the PCB Where the MSI board leaps ahead is when it comes to lighting, the EFI and software. It has a row of RGB LEDs on the right underside, which can be configured in MSI’s software. There’s also a 4- pin RG B LED header and extension cable in the box. and aerials for the Wi -Fi module. MSI’s EFI is still a long way ahead of ASRock and indeed Gigabyte’s efforts, although the latter two companies have made significant strides with their Z270 boards, especially in areas such as fan control. However, MSI’s EFI is more pleasant to use. less laggy and much clearer, much like Asus’ EFI. If we were going to spend a number of hours tweaking, we’d prefer to do it on the Z270I Gaming Pro Carbon than either of ASRock or Gigabyte’s boards this month. MSI’s fan control systems in its EFI and Windows software are still good too. but ASRock and Gigabyte now allow for more control, allowing you to turn off fans entirely, tike Asus. However, Gigabyte and MSI are otherwise fairly even when it comes to Windows software. The RGB LEDs on the underside can be configured in software. The MSI board only needed 1.25V to get our chip to 4 8GHz too, which saw a healthy 7 per cent increase in its RealBench score. The audio and storage speed results were very similar between the ASRock and MSI. though, with little to separate the two boards. The Asus ROG Strix Z270i Gaming is undoubtedly the best premium board on test this month, but the MSI Z270I Gaming Pro Carbon remainsa decent board at its slightly lower price It overclocks easily, has an excellent EFI and software bundle, and it offers RGB lighting too. The ASRock Fatality Z270 Gaming has more USB ports. SATA ports and Thunderbolt 3 support, but the MSI has a more polished EFI or RGB lighting, If you don’t need the Asus board’s features and want to save a little cash, the MSI Z270I Gaming Pro Carbon will still do you proud. Can’t quite match the competition from Asus, but the MSI still offers a solid EFI and RGB lighting for a reasonable price.